As it turns out, Luke Cage is good buddies with Daredevil. So, naturally, when the blind attorney ninja finds himself at the center of his publisher's latest event, Shadowland, every series touched by that character or any of his supporting cast is immediately sucked in, like so much driftwood along the outer edges of a short-lived whirlpool. 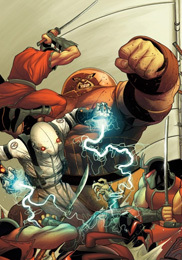 Such is the predicament with Thunderbolts this month, as Cage realizes that he can use his squad of convicts and ragamuffins to confront his old friend in a brazen show of force. Writer Jeff Parker does manage to preserve a lot of the book's individuality, though, which is key to maintaining the interest of his regular readers in spite of the diversion. While it's technically a tie-in to the big crossover that's looming above Daredevil at the moment, this issue is primarily a story about the Thunderbolts and how the action in Hell's Kitchen is affecting both the team and their leader. The story splits its focus between Luke's street-level view of Daredevil's dark kingdom and the rest of the team's exploits in prison, biding time while they wait for the squad's designated leader to return with a new mission. Both provide plenty of opportunities for character development, and Parker doesn't disappoint. It's no easy task to turn such a vile cluster of villains into a team worth rooting for, but he manages via playful, entertaining back-and-forths and a few not-so-subtle outbursts in the prison mess hall. The spirit of this team remains unlike that of their squeaky clean counterparts, and that's responsible for a great deal of its allure. On the visual side, I loved what I saw from Declan Shalvey this month. His quick, concise artwork cuts to the core of each character, telling more with less, and isn't above trying a few new techniques here and there. Shalvey's limited linework results in a page that's easy to navigate, but still crams in plenty of atmosphere, perspective and individuality. He's not unlike a young Chris Bachalo, still trying to find precisely where his niche actually is, but definitely on the scent of something big. He gives the issue a light tone that's in sync with the witty, casual banter of the team on a mission, with both flashing hints of a more sinister true character. Too often an issue like this one tries to stretch itself in two different directions, directly continuing the story of the main crossover while introducing the unique perspective of its own series. It almost never works. Followers of the big event skip out on it as an inessential chapter, while dedicated followers of the series itself feel betrayed by the sudden unannounced change in focus. Where other writers often feel compelled to please everyone, though, Jeff Parker isn't afraid to make a choice and stick with it: this might be listed in the checklist of Shadowland tie-ins, but it's not just another chapter. Regular Thunderbolts readers shouldn't feel like their series has been taken captive. Those less familiar with the team but interested in the event will find enough forward momentum to make it worth a purchase, along with more than one reason to keep up with the series after its involvement with Daredevil comes to a close. It's a rarity. Buy it.